SOUTHERN HEMISPHERE 18 EXPORTED TO THE UNITED STATES, EUROPE, AND JAPAN. THE PURCHASE OF THE ENTIRE SURPLUS OF AUSTRALIAN AND NEW ZEALAND WOOL. SO LONG AS THE BLOCKADE 16 MAINTAINED. in coming months will depend largely upon foreign developments. was 22 percent higher than in April, but 16 percent lower tha in May 1939.
larger than average January-May consumption in the 10 years 1929-38.
in prices of most grades of wool in Argentina. in the month, according to reports of the Agricultural Marketing Service. The price advance in June was greatest on medium fleece wools. prices substantially above the parity price in 1940.
in May 1939 and were much larger than average May imports in recent years. 1937, when 111 million pounds were imported. 1939 and a 5-year (1934-38) average for those months of 52 million pounds. percent larger than av'-rcge January-May consumption in the 10 years 1929-38.
close to 50 million pounds of grease wool, all of domestic origin. of wool have been nominal. million pounds for those months in the five seasons 1934-35 through 1938-39.
average of 87 million pounds. present. Exports by countries in the current season are shown in table 4.
about 8 percent smaller than average June 1 stocks in the 5 years 1935-39.
to be smaller than in the 1938-39 season. The 1939-40 season in the Union of South Africa closed on June 30. 1940-41 clip will not be available in quantity before September. than usual. Exp-rts by countries from July through .MTc' are shown in tnble- 3.
office of Foreign Agricultural Relations. season are representative of production. 3/ Auction and private sales and wool shipped unsold. 5/ Weight of greasy and scoured combined. pounds annually in recent years. wool exported on skins as well as production of shorn and pulled wool. on data on appraisals, sales and carry-over. smaller than in the same months of the previous season. creased materially in the last half of 1939 and in early 1940.
sumption of wool was reduced in the early pert of 1940.
regardless of peace moves in Europe. fall and winter of 1940-41.
used in overcoatings anC in some uniform cloths in the military service. for the Army and Navy is prohibited by law. i: l. lb. Mi. lb. Mil. b.
l/ 3-year average 1937-39; not separately reported in earlier years. clip will be available in the fall. 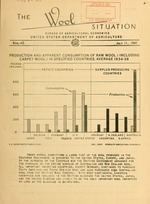 also supported wool prices in the South African market in the 1939-40 season. importers of South American wool. production, are produced in relatively small quantities in South America. and the Union of South Africa. : Mil. lb. Mil. lb. published by the Imperial Economic Committee, United Kingdom. Reports of the Agricultural Marketing Service except as otherwise noted. .bor Statistics. 5/ Domestic yarn, first quality, Bureau of Labor Statistics. September. 9/ No quotations. 10/ Ten-month average, no quotations, July and A.i.-rt. 11/ Eight-month average, no quotations, August through !o.v:-mb:-r.
Import figures from the Bureau of Foreign anrc DFomestic Crommncrcc. machinery activity frcm the Bureau of the Census. 1/ 7;ei-ht. of greasy, scoured, and skin wool added together. received from pullerics and is mostly washed. 1/ Weight of grease and scoured wool combined. Data by countries not yet available for May. 1/ Preliminary. 2/ Argentine figures include small quantities shipped to Canada. 3/ If any, included with "other."